Lyle: Combining classical music with heavy metal guitar riffs and techniques was the signature style of the late Randy Rhoads. From only two recordings with his original band, Quiet Riot, and two with ex-Black Sabbath singer Ozzy Osbourne, Randy reached legendary status in a very short time. Randy's brief time on this planet left a mark on every guitar player who wanted to be a metal guitarist. He favored Gibson Les Paul custom guitars as well as the Jackson "V" or "Randy Rhoads" signature model guitars that he helped design. He used a heavy distortion sound and many times for the studio recordings he double tracked all his parts to make them bigger sounding. For your live sound, try adding a slight delay, about 75 to 100ms with no extra repeats. Lyle: The first part of the lesson sample starts with a solo classical guitar piece I wrote in his style. Your right hand will be finger picking the strings, just like a classical guitarist would. Lyle: This is in the key of B major. I've broken it into 4 riffs to make it easier for you to learn. Here we go! Lyle: Once I have all 4 riffs up, I'll send you a movie of me playing all 4 parts together. surista: Are you barring the E-B-G-D strings with index finger? Lyle: Yes, your 1st finger is held down to play those strings at the 9th fret. Lyle: As you learn the tabs for all 4 riffs, notice that it's all in the key of B major and you're using the 1 - 4 - 5 chords, B - E - F# to make the song. Lyle: Let's move into the next part of the lesson, the metal rock style! The palm-muting technique is a key element in the heavy metal style. Using this technique will help you achieve a tighter, more percussive sound. 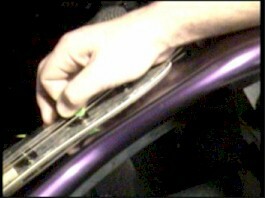 Simply rest your picking hand on the bridge and use the heal of your hand to slightly mute the bass strings. Here's a video clip showing where to put your hand. Lyle: I suggest you angle the pick downward as you pick down and up. 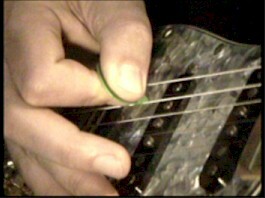 Here's another view of how I hold the pick for palm muting. Notice in the pictures and video clip how the heal of my hand covers the bridge. The pick is actually somewhat sideways not flat, angled down. Lyle: You are going to learn 4 rhythm riffs and put them all together. This is the section from the lesson sample between the classical intro and the solo. Lyle: The next riff moves up a string to the A chord and has a Randy signature riff at the end, a real fast pull-off riff. Lyle: Here's the 4th riff of this section, it has a cool riff in the middle of it. It's an arpeggio, a diminished arpeggio with a pinched harmonic at the top note. remy: What effects do you have with that pinched harmonic? Lyle: I'm using a slight delay effect, 75ms and 100ms. Lyle: So really, the lesson sample from the top of this lesson has just 3 parts to it. The classical intro, the middle rhythm section you just learned, and the solo section on the end. Lyle: Each note is picked using alternate picking. There are no hammer-ons or pull-offs. You pick each note hard to create a louder sound that will cut through the mix. Lyle: Once you learn the solo, you can use the last jam track I sent to play it over.